Discount Dumpster has a specialty for renting dumpsters in Mesa. Reach out to us by phone or we can contact you if you request a quote. We aim to surpass our customers’ expectations for clear communication and low prices for dumpster rentals. We’re happy to serve our customers with dumpster rentals in Phoenix and surrounding cities. Finding a suitable dumpster rental company to work with is easy with Discount Dumpster. We work to provide top notch service with prompt delivery and pick up. Our flat rate pricing eliminates any confusion so our customers can be assured they’re in great hands with Discount Dumpster. Outstanding service. Dumpsters are always clean, delivered and picked up on time. I will definitely be coming back. Always on time and dependable for my dumpster rentals across the city. Thanks Discount Dumpster! Polite and fast service!!! No complaints!!! This was my third dumpster and each time it's been a great time. Great company to work with and very accommodating. Highly recommend this company! Very helpful and professional. Highly recommended. Great Company to work with. Prompt drop off and pick up! Very prompt friendly and professional. Best price in the valley! We’re servicing Mesa for its dumpster rental needs and focused on helping our customers focus on their construction projects, while we focus on the disposal. Our team is here to make sure your dumpster rental goes smoothly and effectively so you can get to work on your project! At Discount Dumpster, we strive to offer our customers wholesale prices on their dumpster rentals. 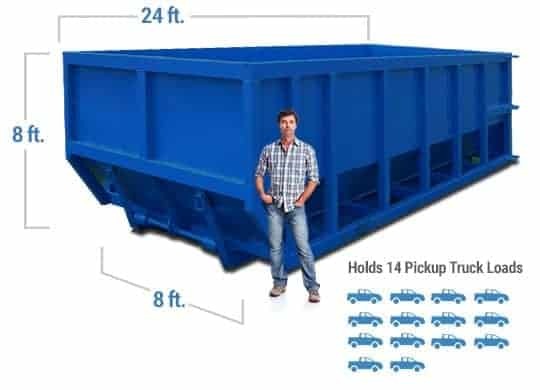 It’s important that you obtain the lowest dumpster cost for your project, so you can spend your money on the improvements you’re working on, disposal is just a byproduct of your awesome renovation or cleanup! Planning a project that will need multiple containers? We have enough cans and drivers to provide. Utilize a local hauler that will deliver your container on time and work with you to get the job done. Talk with our team today and we will team you up with the best size so that you save time and money with your construction job. How much does a dumpster permit cost? A dumpster permit contains two types of charges. There is a cost to pull the permit and then a daily rate for that permit. Though it is rare to need a permit in the City of Mesa. Before pulling a permit be sure to check if you actually need one. Commonly referred to as a right of way permit, which may be used for a dumpster which will be in a public street or cause a slow down in traffic. Still have questions? Feel free to jump on a call and we will help you with your dumpster rental questions.